Published: Jan. 16, 2014 at 03:48 p.m. Updated: Jan. 16, 2014 at 05:05 p.m.
As Chris Wesseling noted in his NFC Championship Game preview, Colin Kaepernick has endured his struggles against the Seattle Seahawks. 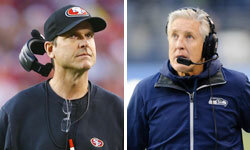 » Coaches among NFL's best feuds? While the San Francisco 49ers quarterback boasts a 91.6 passer rating this season, that figure tumbled to 41.7 in two games against a Seattle unit boasting one of the top-five pass defenses of the last 64 years. Their leader is cornerback Richard Sherman, who once called 49ers coach Jim Harbaugh -- his coach at Stanford -- a "bully," and maintains a well-documented disdain for all things San Francisco. "There is no love lost; there is no love found," Sherman said. "That's how I'd characterize it. It's going to be intense. It's going to be physical. I don't know if there are going to be handshakes after this one." On Thursday's "Around The League Podcast," we wondered aloud how Kaepernick will fare against a defense he's historically floundered against. Sherman and Byron Maxwell were first and second among all cornerbacks in opposing passer rating this season, per Pro Football Focus -- and have we mentioned star safety Earl Thomas? It's fitting to see the NFC boil down to this: The conference's two most physical squads, equally determined to pound opponents with the run and smother with punishing defenses. They despise each other -- maybe -- because they're so much alike and -- definitely -- because they see in one another the final hurdle to a long-awaited February voyage to MetLife Stadium.